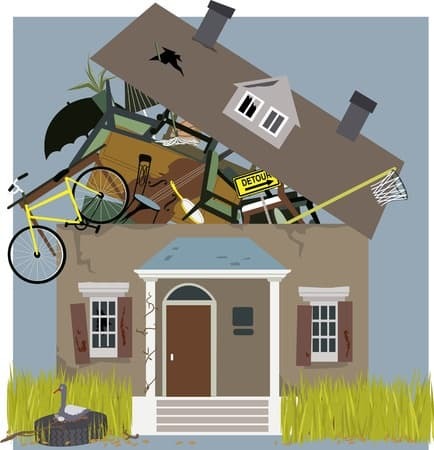 The Mayo Clinic defines hoarding as “a persistent difficulty discarding or parting with possessions because of a perceived need to save them.” Hoarders rarely see their hoarding as a problem, even when the situation becomes dire. There are 12 primary symptoms or signs that describes hoarding. Hoarders do not easily give up items that have accumulated for years, even decades. Hoarders refuse to let others throw away or even touch their clutter and garbage. Hoarders have clutter piled so high that main living areas are uninhabitable. There is only a small walkway to get from one room to another. Sometimes the hoarder has to climb over piles of “stuff” to get from one area of the same room to another. Hoarders use paper plates or fast food containers once all the dishes are dirty. Rotted food is likely amongst the clutter. The hoarder often cannot bathe because the bathtub and sinks are full of accumulated clutter. Clutter is moved just enough to have a place to sleep or watch television. Empty food containers, leftover food and piles of garbage become a feast for bugs and rodents. The piles of clutter are excellent nesting areas for mice and rats. The general filth produces strong odors that are even detected on the outside of the premises. Hoarders refuse to part with their clutter, saying it is “needed.” Broken appliances and furniture, items with pieces missing, disposable food containers, old tires or broken tools are “needed.” Hoarders claim items are “valuable” even when there is clearly little to no value. Hoarders often have large numbers of pets inside and outside their home. Hoarders may have dozens, even hundreds of pets, suffering from malnutrition and illness, living in unsanitary conditions. Dead pets on the premises are not unusual. Hoarders have no organization to anything and not just to their accumulated clutter. Pieces of furniture are sometimes thrown atop piles of clutter as are new items as they are brought home. Even in case of a serious maintenance issue, hoarders often refuse to permit maintenance or repair workers to enter their home so they can hide their hoarding. Hoarders may have no utilities due to non-payment of utility bills, adding to the unsanitary living conditions and stench. Hoarders not only avoid social situations but may refuse to allow their own family members to enter their home. This is not only due to embarrassment but fear that family members may insist the hoarder get rid of their clutter and garbage. Hoarders refuse to see their clutter and garbage as a problem. They are so accustomed to their lifestyle that others are seen as intruding into the hoarder’s life. Hoarders protect their belongings to the point of combativeness if anyone, even family members or professionals, attempt to throw it away. Even with threats from housing inspectors to condemn the property or with threat of eviction, hoarders may still refuse to get rid of their decades of clutter and garbage. Hoarding is a mental health issue. There are several barriers to overcoming hoarding and receiving treatment. Since hoarders see nothing wrong, they often refuse treatment. Sometimes it is only by force that the garbage is disposed of and the hoarder receives treatment.